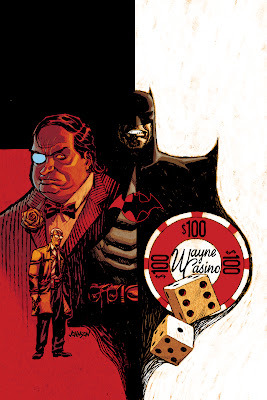 Fruitless Pursuits: Week of the Bat! When I first heard that it was Batman week at Fruitless Pursuits, I thought to myself "Wait, isn't EVERY week Batman week?" and of course, the answer is YES! However, we can always take a little time to celebrate *my* favourite super-hero, the icon who has done more to inspire my life than all the politicians and most of the non-fictional do-gooders that have ever existed, the Dark Knight himself! So what's bat-happening this week in my neck of the woods? 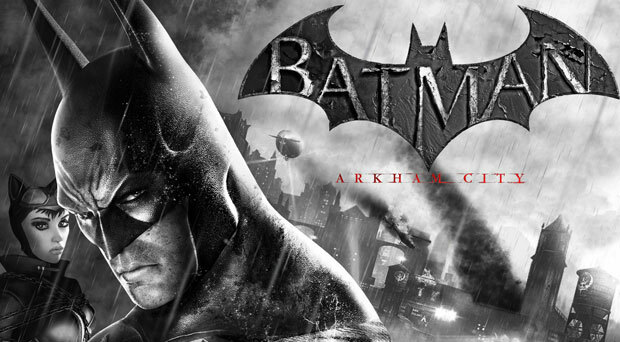 Well, first off, Batman: Arkham City. I've spent hours and hours playing this game and am still only about 25% done. It's joined the ranks of such games as Super Mario Brothers 3, Shadow of the Colossus, Prince of Persia: Sands of Time, and yes, Batman: Arkham Asylum as one of the greatest games of all time. At least in my opinion! Great graphics and gameplay, riveting storyline and just the overall cool factor make it a must-have game! Go buy it right now! If you need to, get an Xbox JUST to play this game. It's that good. But that's not ALL the Batman had to offer me this week! Find out what else is happening in Gotham after the Bat-jump! With The Dark Knight Rises coming to theatres relatively soon, I wanted to know more about one of the featured villains of the movie, the man who "broke the Bat", Bane. Luckily, I found a huge trade paperback trilogy, reasonably priced at my local comic book store that reprinted the entire story! 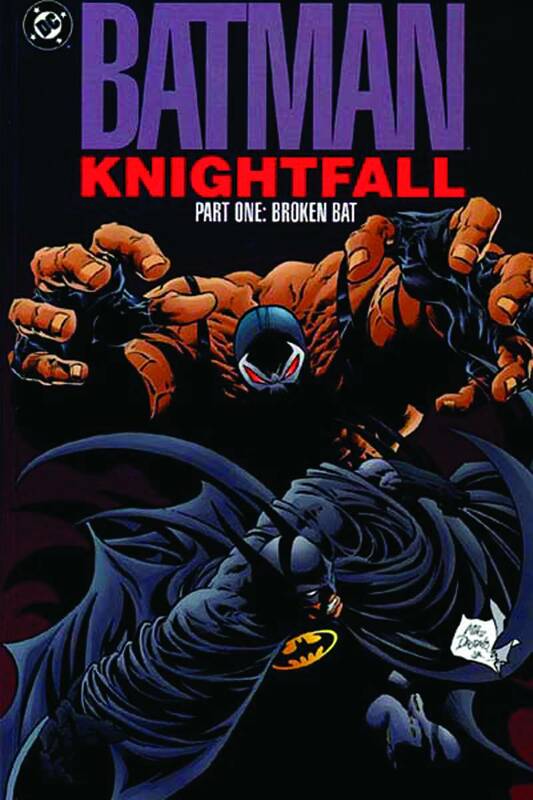 This collections is known as Batman: Knightfall parts 1-3. 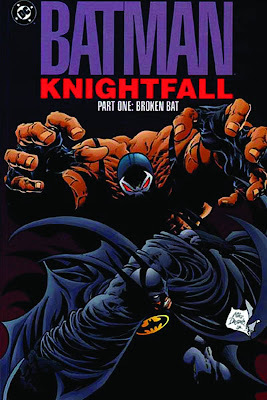 I have to admit that part one, wherein Batman has to chase down almost every bad guy he's ever met until he finally meets Bane, with pretty horrific results, was by far the best. However, all three parts of this trilogy were very much worth reading. It's interesting to go back in time and see the differences in the artwork and storytelling. If you ever see this collection in stores, I'd definitely recommend picking it up. It's worth the read, just to see Batman fall, and eventually, perhaps, learn to pick himself back up. Not to be outdone, the modern DC universe also had a surprise for me this week. The hardcover collection of DC's Flashpoint came out yesterday! This is the story of WHY the DC universe is rebooted into the new 52. I was very glad to finally understand what the heck was going on! I know, you're thinking "But Stryder, that's a FLASH story and we're talking BATMAN!" True enough. However, Batman is the main supporting chracter in this tale, in a sense. I don't want to spoil anything, but this IS a Batman story and it is NOT the Bat we're used to. Without giving anything away, I will say that the last scene of Flashpoint, set in the bat cave, literally moved me to tears. A comic book made me cry! Those who've already read it know just what I'm talking about, I bet. If you haven't already read it, just go buy it right now. I'm sure it's still at your comic book store since it just came out yesterday and I KNOW you WON'T regret it! Well, I could go on and on about the Bat, but I think that's enough for one post, don't you? Until next week...same bat-time, same bat-website!